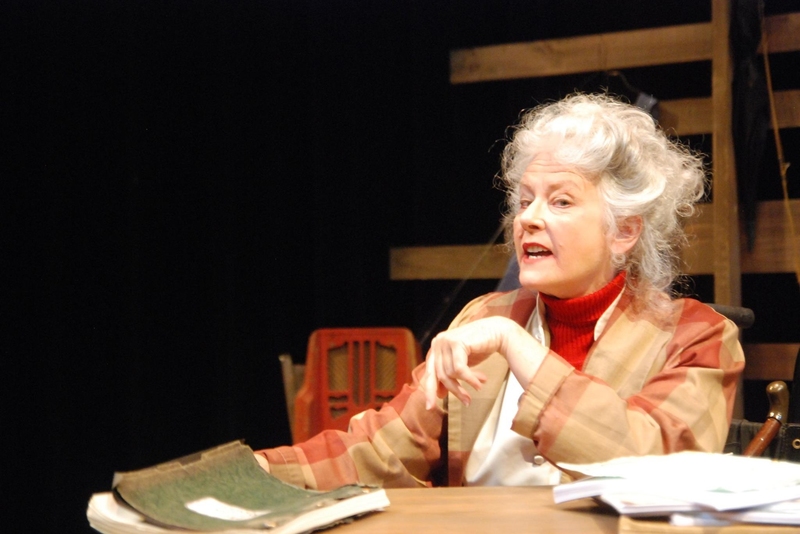 Janis Stevens is the great actress in “Kate: The Unexamined Life of Katharine Hepburn,” being presented by Lost Nation Theater through Sept. 17. "Stevens is both convincing and irresistible as Hepburn"
MONTPELIER— Katharine Hepburn (1907-2003) was among Hollywood’s most enigmatic actresses. At times haughty, aristocratic and an unrepentant trailblazer, her career took her from box office poison to America’s most beloved female movie star. Hepburn was also known for her passion for privacy, holding on dearly to the inner secrets of her successes and failures. Many of those private thoughts are being revealed and explored as Janis Stevens becomes Hepburn in “Kate: The Unexamined Life of Katharine Hepburn,” presented by Lost Nation Theater Sept. 7-17, at City Hall Arts Center. Thursday’s preview performance offered a startling and revealing look at this fascinating woman. Hepburn was unusual among Hollywood stars in that she grew up in a sophisticated, well-to-do Connecticut family, her father a trailblazing urologist and her mother a women’s suffrage activist. She discovered acting at Bryn Mawr College and pursued it relentlessly from summer stock to Broadway to Hollywood. Still, unlike other actresses, she could afford to fail. When her film career was bombing out, she bought herself out of her RKO contract and bought herself success in “The Philadelphia Story” on Broadway. She convinced her then-lover, Howard Hughes, to buy the film rights, thus cementing Hepburn’s place as one of Hollywood’s biggest stars. This is one of the many stories told in the show, illustrating just how Hepburn took control of her career in a way seldom achieved by men, and virtually never by women. Much more enlightening, though, is the more personal stuff. Of course, there is her 27-year affair with the married actor, Spencer Tracy, the man she said she would do — and did — anything for. Bringing Foster’s story together is Hepburn’s troubled relationship with her family, particularly her father and eldest brother, whom she adored. These stories bring meaning to both Hepburn’s success and her vulnerabilities. Directed by Peter Sander, Stevens is both convincing and irresistible as Hepburn. Even her physical and vocal performance, though not literal, is uncannily realistic; it is Hepburn’s spirit that comes through strongest. Stevens takes the audience on Hepburn’s journey, and it is easy to forget that she isn’t Hepburn. At times, Foster’s script seems a bit overwrought with philosophy, but only momentarily. And the otherwise fine sound design by Sander and William Myers is a bit too literal, sapping a bit of the play’s power. Kim Bent’s set design and Thomas Gunn’s lighting, though, complement the storytelling. Stevens’ reliving of Hepburn in her final years is very personal storytelling; entertaining, fascinating and compelling. “SelectedWork,” paintings by Montpelier artist Los Eby, is on exhibit in the lobby during the run of the show.